Before getting into the procedure of receiving dental implants, you should probably know what they are first. 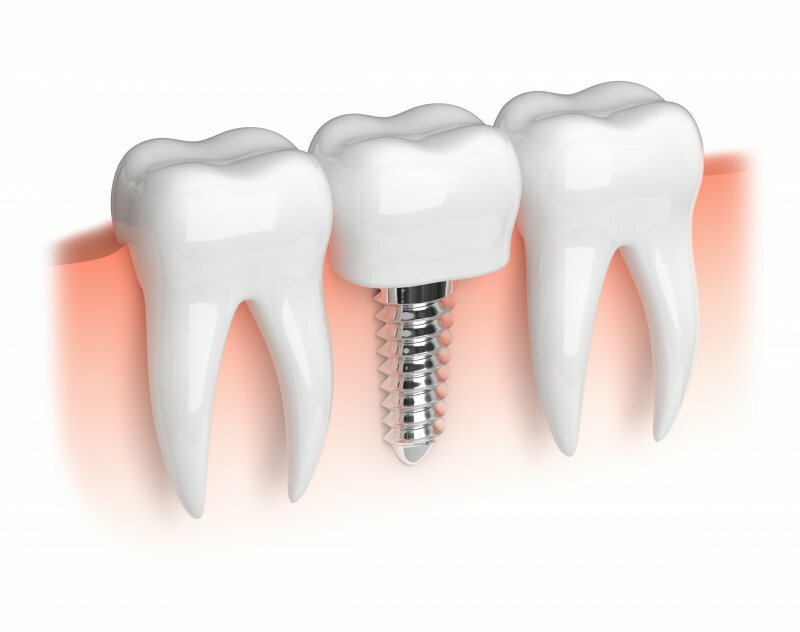 A dental implant is a titanium post that is placed in the jaw to support dental restorations. Think of it as an artificial tooth root, which fuses to your jawbone to create a long-lasting replacement. Because titanium is biocompatible, it will integrate into the jawbone. After that, an abutment (connector) is placed so that your restoration (false tooth) can be mounted. With proper care, the dental implant itself can last a lifetime! First, your dentist will come up with a treatment plan that is specific to your smile. They’ll take X-Rays and molds of your teeth and mouth. Additionally, they will make sure that your jawbone is healthy enough for the placement of dental implants. If you have a weaker jawbone, your dentist may recommend a bone graft (a transplant of healthy bone to the area of your jaw that needs strengthening). During surgery, your expert dentist will make a small cut to open your gums and expose your jawbone. They will then drill holes into the bone, which they will fill with the dental implant posts. This sounds painful, but you will be given anesthesia, so you won’t feel a thing. The abutment (connector) can be placed during this process or after the implant is fused to your bone, depending on your dentist and your smile. Once the implant is placed, you’ll be given some type of partial denture to help with appearance while you wait for your jawbone to grow. During this process, your jawbone will grow around the titanium post, which integrates your implant as a permanent and sturdy base for a new tooth! This can take up to 6 months. Now for the fun part! After the abutment is in place and your gums have healed, your dentist will take more impressions of your mouth to make your new tooth or teeth look as natural as possible. This will ensure you walk away with a great looking and feeling smile. Eat only soft foods for the first 10 to 14 days and then practice good oral healthcare. You can use special brushes that help clean in between your implants and be sure to see your dentist regularly to make sure your smile is in tip-top shape. Additionally, watch out for damaging habits that can hurt your restoration like chewing on ice or using tobacco products. Both of these habits can damage your teeth and cause your implant to fail. Now that you know more about how dental implants are placed, are you ready to complete your grin? Contact your dentist to get started on a beautifully whole smile with dental implants. Dr. Gary Henkel has been providing quality care to his patients for almost 4 decades. He takes pride in boosting his patients’ confidence through expertly placed dental implants. He currently practices at Horsham Dental Elements, and he can be contacted through his website or by phone at (215) 672-6666 for any questions.